The Brazilian Armed Forces received about 300 ex-surplus M41 Bulldogs from the US Army, as their light weight proved ideal for the countries terrain, however they lacked a decent operational range, so an upgrade program was implemented to increase this and the firepower, with all work was carried out by Brazilian firm Bernardini. M41B: The original 500hp petrol engine has been replaced by a Brazilian-built Saab-Scania DS-14 series diesel. A new cooling and electrical systems were fitted. The original 76mm main gun was re-bored to 90mm calibre for increased lethality. 286 of the original 300 received this upgrade and all upgrade work was completed by 1984. M41C: This was a second upgrade. 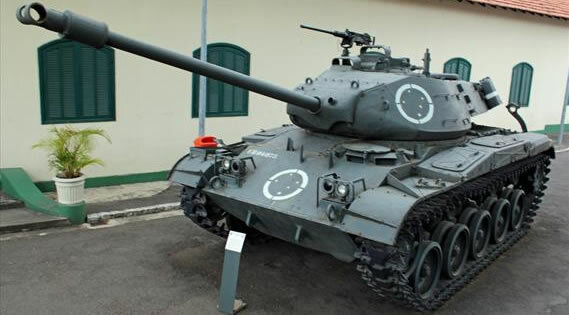 The Brazilian Marine Corps ordered 35 M41C tanks, these being M41Bs with an up-to-date fire-control system, appliqué armour and the 90mm Ca 76/90 M32 BR3 main gun. Deliveries were completed by 1990.